Philbeck visited this magnificent area in the Grand Tetons National Park early one morning in late June. There was still plenty of snow on the mountains. 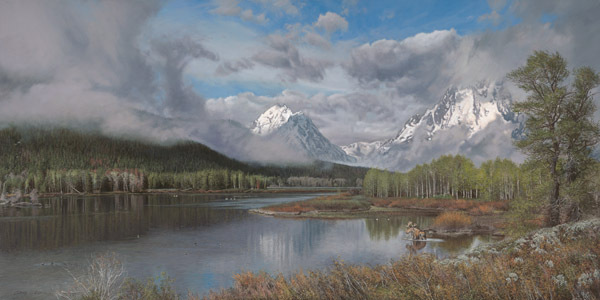 The artist noted that the contrast was so wonderful with spring bursting forth on the lowlands, yet the range still contained a cold snow-pack. Spring in this magical place brings abundant, new life....lots of waterfowl, elks, and moose come to feed on fresh, new growth. There is only a brief time to take advantage of the growing season in the area, so spring comes quickly to the area.